We are one of the noteworthy companies engaged in offering a wide range of Elevator Chains. Our offered range is widely acknowledged in their market guaranteed performance, dimensional accuracy, high tensile strength and excellent surface finish. This sturdily constructed range is offered by us in various standard sizes and custom-design forms to meet the distinctive requirements of our patrons. 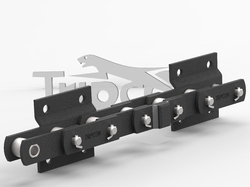 Clients can avail from an extensive array of Heavy Duty Elevator Chain in Staright as well as Crank Side Plates. 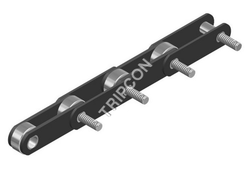 Tripcon Offer Elevator Chains in varied pitches and breaking load capacities. These offered elevator chains are constructed using optimum quality raw material under the strict supervision of our hardworking team. Moreover, our team fabricates the entire range as per industry laid norms to ensure their defect free nature. 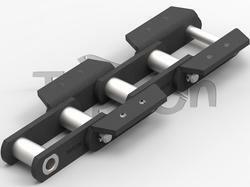 We hold expertise in offering a wide range of Conveyor Elevator Chain. Extensively being used in various Cement Industries, our products are manufactured in accordance with the international quality standards. We offer this range in different styles of attachments such as K2, K24, K3, K44, K443, to meet the distinctive requirements of our clients. These Elevator Chains are stringently examined by our quality controllers team to ensure the flawlessness of our products. 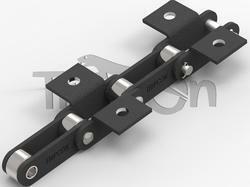 We are instrumental in offering a wide array of 4" Pitch Elevator Chain. 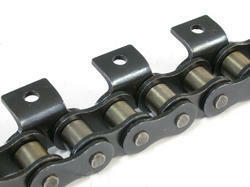 Offered Chains find extensive application in various industries and sectors. 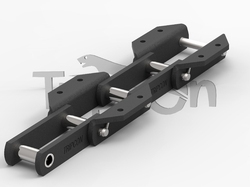 These offered Pitch Chains are functional for enclosure applications in Heavy Metal Industries. Customers can avail a customized range as per their needs at market leading prices. With firm commitment towards high quality, we are able to bring forth a comprehensive gamut of 75mm Pitch Elevator Chain to our patrons. 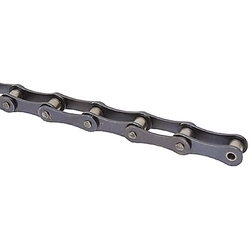 Offered Elevator Chains are widely regarded for use in various sectors and industries. Moreover, the offered products can be availed in different sizes as per the patrons requirements and needs as per the emerging trends. Because of our vast experience, we have been successful in catering to the requirements of our esteemed clients by offering a qualitative range of Elevator Chain. These comprehensive assortment of products are exclusively used for various industrial applications, offered by us in various specifications. Our quality controllers team strictly check these products on the basis of various well-defined parameters. Provided by us is a superlative range of 76.2mm Pitch Elevator Chain to our valued patrons. These offered Chains are designed and developed in compliance with the international quality standards under the astute guidance of our team of experienced and qualified experts. We make sure to test the products on certain quality parameters to ensure their flawlessness and error free nature. We bring forth a commendable array of 9" Pitch Elevator Chain to our clients. Our team of qualified professionals manufacture the entire range as per industry laid parameters. Offered range is fabricated by making use of optimum grade raw material that is procured from the most credible vendors of the industry. These chains can be availed in various sizes and specifications. Fabricated using Steel grades, which after heat treatment gives low coefficient of friction, high strength, durability and optimum output to the equipment. We are suppliers of Conveyor Flight Chain. Manufactured using qualitative raw material procured from certified vendors of the market. To ensure the defect-free nature of the products, these products are thoroughly examined on various parameters.